You will be given a reference e-book to read which has 810 pages And the test will be based on that e-book , you can take final test within 1 year of purchase. Ribbon with Tabs. This works as a default for 3D modeling workplaces and 2D drafting and annotation. ViewCube Interactive Tool. This specific AutoCAD 2009 feature is useful in rotating and orienting surface and solid models and you can do this by simply rotating the cube. SteeringWheels Quick Access Tool. It allows immediate access to vital commands such as center, pan, zoom and orbit. Browser Interface. The interface of the AutoCAD 2009 is beautifully designed and comes in a browser form. It makes it easier for you to easily review and work on multiple files. It lets you view well detailed information about the sizes of files and its creators and you can also easily use it to organize files based on their titles, dates and names. Other great features of the AutoCAD 2009 version are modeless layer dialog box, quick properties menu, quick view layouts and drawings, macro recorder, Xref clipping, microstation V7 DGN support and geographic location. If you want to get a more professional and comprehensive AutoCAD 2009 training and tutorial, then note that Brainmeasures, which has already proved its effectiveness in providing the best online certification courses to the public, can offer you a well-detailed AutoCAD 2009 certification program. The AutoCAD 2009 course from Brainmeasures is highly comprehensive enough that it walks you through all the aspects related to this AutoCAD version. Enrolling in the Brainmeasures AutoCAD 2009 certification course increases your chances of understanding all the vital features that are now installed in this software and how you can use it to boost your productivity especially if you are into designing and drafting. It allows you to understand everything about AutoCAD LT 2009 so you will come out as an expert in this field as soon as you complete the certification course. Passing the online AutoCAD exam which plays a major role in assessing your skills and knowledge in the field gives you the opportunity to finally take a hold of your AutoCAD 2009 certificate which is an excellent representation of your expertise and skills in using this specific AutoCAD version. 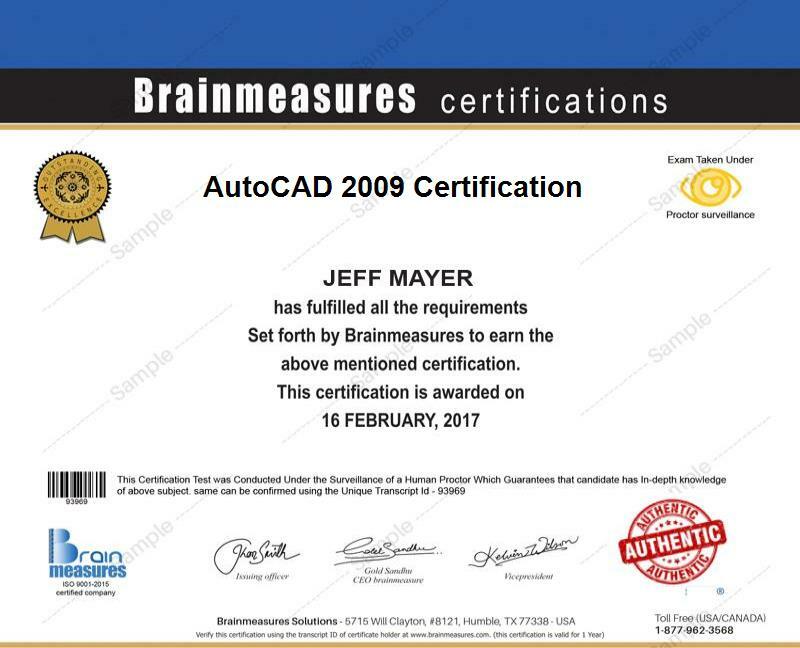 The AutoCAD 2009 certification program which is now available at Brainmeasures is extremely beneficial for you especially if you are an aspiring or existing design professional. You can expect this to work for all individuals who wish to succeed in their chosen design professions by taking advantage of their skills and knowledge in AutoCAD 2009 to improve their productivity, accelerate their professional development and enhance their credibility in the industry. Because of the great demand for AutoCAD experts at present, your AutoCAD 2009 certification is a huge help in further increasing the level of your income. As an AutoCAD 2009 certification holder, you can start earning from $51,000 to $81,000 with a potential for more growth in the coming years and as you gain more years of experience and become more recognized in the field. You may also offer your services online and this will allow you to charge your clients on an hourly basis. You can charge them from around $15 to $38 per hour.